From PETER DIAMANDIS, chairman of the X PRIZE Foundation and co-founder of Singularity University! Have you noticed that the world around us is rapidly changing? New technologies are emerging every day and transforming the way we live, work, play, and interact. Some people are becoming incredibly rich, respected, and successful because of it. In large and small ways, they are making history. Others are like a man standing on a train station platform watching the trains come and go. He knows they are going somewhere. But he’s not. Today, I’d like to introduce you to a man named Peter Diamandis. Peter Diamandis is the chairman and CEO of the X PRIZE Foundation — the company that put up a $10 million prize for the first person who could put a private craft into space. He’s the co-founder and executive chairman of Singularity University. He founded more than a dozen space and hi-tech companies, including Zero Gravity Corporation, Space Adventures, and the Rocket Racing League. He’s also a founder of International Space University. I’m telling you all of this because I want you to notice something. All of these ventures have made other people very wealthy. That is what Peter does. He empowers other people to change the world and become wealthy and successful in the process. Today, I’m going to show you how you can become a “history maker” and flood your life with abundance by using Peter’s proven strategies and formulas. In 1982, a man named Burt Rutan quietly opened the doors on a small composite company. His mission was to design experimental aircraft and provide a place where larger companies could quickly test new materials and designs. For more than 27 years, that is exactly what Burt did. Nothing fancy or revolutionary... or profitable, for that matter. Then Peter Diamandis came along and announced to the world that he would give $10 million to the first company to put a private spacecraft 100km into space. With this incentive, Burt realized that many of his composite materials and designs could do exactly that. He felt he could win the prize. His enthusiasm, and the incentive, sparked a flurry of activity, innovation, and manufacturing. He was able to quickly get an investor to put in more than $30 million dollars and assemble a team of some of the brightest, most innovative minds in the country. In the end, Burt did win the X Prize and the $10 million. But that was nothing compared with the money he made licensing his designs and technologies to Richard Branson, founder of Virgin Galactic. Burt became extremely wealthy using none of his own money, changed history, and sparked a multibillion dollar private space exploration industry. Of course, in the process of all this, thousands of other people have become wealthy, creating new technologies and greatly increasing the abundance in their lives. Now, I realize that you and I might not achieve success of this magnitude. But, then again... why not? I told you before that Peter is the Maker of History Makers. You may not want to “make history” on a national or international scale. But what about for your own life? What about for your family? What about for those in your immediate circle of influence? How would you like to be the center of a massive outpouring of wealth, innovation, success, and prosperity, the force behind a wave of abundance that rolls over your friends, family, and associates, the way it did for Burt? You see, despite what the pessimists and naysayers on the news tell you, we live in an era of exponential growth and abundance. Astonishing new technologies are driving a new world where the unimaginable is being imagined and turned into reality. For example, do you know that according to a Harvard study, we are living during the most peaceful time ever in human history? The Middle Ages were 80 percent more violent than society is today! The cost of food has come down 13-fold, the cost of energy 20-fold, the cost of transportation 100-fold and the cost of communication 1,000-fold. That’s extraordinary! And it will only get better. The forces that led to this improvement are accelerating at an exponential rate. Let me tell you what I mean by exponential growth and how it will affect your income and lifestyle. If I asked you to go out your front door and take 30 steps, I’ll bet you could guess about where you’d end up, without even taking that short walk. It’s a simple linear, step-by-step experience, and you’ve done it a thousand times. If you took 30 exponential steps out of your front door, where do you think you’d end up? The answer? You’d go around the earth 26 times! The first Apple computer was sold just over 30 years ago. It sold for $2,000... or in today’s dollars about $8,000. It didn’t include a keyboard, a monitor, memory, or a mouse. In 2000, Apple was on the verge of bankruptcy. Today, you can buy a very nice iMac for $1,200 (a 667% savings!) and Apple Inc. is a $662 billion company. Yes, I want to create massive wealth and abundance for myself and the people and causes I care about, by learning how to capitalize on today’s new and emerging technologies. personal money or knowledge to change the world! For those who get on the train and capitalize on the new and emerging technologies, there is literally no end to their abundance and wealth. Even more important... those who understand and use Peter’s approach to wealth and abundance creation can drastically and rapidly transform their life... even if they aren’t tech-savvy. In fact, using Peter’s systems, you don’t even need money, a business, industry know-how, or technologies! When Peter founded his first university, he was a broke college student. He created a rocket racing company... and yet knew very little about rocket propulsion systems. When he announced the first X Prize, offering a $10 million reward, he didn’t have a dime of the prize money! In fact, the X Prize foundation was not even officially formed yet! How did he do it? The same way as Carnegie and Rockefeller: By leveraging the money and knowledge of others. Trust me... if you have a dream... if you have a passion that you believe in... if you want to make a difference... then Peter is the man to help you get rich and make history in the process. Meet Dean Kamen. Dean is an inventor. Most of his ideas have been developed and funded using versions of Peter’s strategies (I’ll explain Peter’s strategies in just a minute). You may know him as the inventor of the Segway. Dean has just announced the invention of a refrigerator-sized machine that runs on less power than a blow dryer and can produce purified water from any source.... sea, swamp, sewer, oil spill, mud puddle... anything. It produces more than 1,000 gallons a day and can run indefinitely. Imagine the ramifications of this on the world water shortage! How will your personal history be written when you use Peter’s approach? What technologies, ideas, resources, or ideas will you put to work to help you write this amazing chapter in the history of humanity? Let me give you a number of Peter’s strategies. 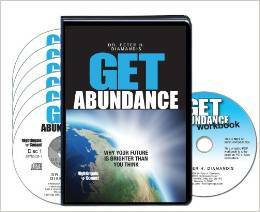 Inside of his new program Get Abundance: Why Your Future Is Brighter Than You Think, you will find complete details on these history-making concepts, plus many more. I’ll start with a few of Peter’s Laws... simple thoughts that Peter calls the “creed of a persistent and passionate mind.” They are the foundation of all his successes... and they can be for you, too. During your first 15 minutes with Peter, he will explain these — and a number of other “Peter’s Laws.” He will give you descriptions, stories, and insights for each. Most importantly, he will show you how to use these simple thoughts to create greater abundance in your life. You’ll be able to take all of this and put it to use immediately. Do you know one of the most powerful ways to create wealth in your life? Be one step ahead of an idea whose time has come. This is the key behind the success of Microsoft, McDonald’s, Boeing, Apple, Ford, GE, and thousands of other big and small companies. They saw where the world was going and got there first by making use of the money and knowledge of others. Few people can see into the near future with that kind of clarity... but Peter can. Peter has identified “8 Exponential Technologies that Are Creating the Next Billion-Dollar Companies.” The technologies that he identifies are just now emerging... but he is confident that they will change the world and create a whole new generation of millionaires and billionaires in the process. Peter will carefully explain each new technology to you. He will give you insights into the impact these new technologies will have... and share with you some very common-sense ideas on how you could potentially profit from each one. Because, as you know, one exponential growth company creates its own ecosystem of wealth and prosperity. Think of the recent natural gas booms in Texas... or the old-style oil and mining boom towns. Entire cities spring up overnight, complete with every imaginable service and good that humans can desire. These 8 Exponential Technologies will do the same. You just need to decide how to collect your share of the wealth... especially since you’ll be hearing this well ahead of the curve, before it’s common knowledge. For example: Can you imagine sitting at home and self-diagnosing any disease, illness, or nutritional imbalance 95 percent more accurately than any doctor on the planet? Nanosensors and micro RF devices are going to make that a reality. What about all the manufacturing wars and trade deficits between states and nations? Imagine if a 4’x4’ box in your closet could eliminate all of that... putting tens of thousands of dollars into your pocket? If you know where to look, it can happen. Peter will show you how. Have you ever dreamed of drastically reducing your stress, uncluttering your life, and eliminating activities that drain you of energy, creativity, and happiness? I think we all have. Peter gives you this number: 1016 per second... and explains how technology will use this number to transform how you spend your time and live your life... and it’s not very far off! It’s time to set aside all of those kinds of thoughts. You don’t need to be that smart... and you don’t need a dime to make your dreams a reality. During your third session with Peter, he will show you exactly how you can get the smartest people on the planet to think, design, invent, and work for you... for FREE. David Baker is a protein research scientist at the University of Washington. His passion is deciphering protein structures. This is important because viruses are basically just complex proteins. If you can decipher them, you can understand how to neutralize their effects. For the past 15 years, scientists have been working hard to crack the code on a protein called M-PMV — an AIDS-causing virus. Using a simple strategy that Peter teaches, David and his team were able to decipher this protein in just 10 days! All for FREE. It cost them almost nothing to solve this problem — a huge step in finding a cure for AIDS. Peter will give you five very specific and practical ways to entice the greatest minds on the planet to solve your problems and turn your dreams into reality for very little money... or even at no cost to you. By creating a competition and prize structure, he enticed more than 23 companies from around the world to collectively invest hundreds of millions of dollars... and untold manpower to create the private space industry. All without spending a dime of his own money on the prize or the research. During your second session with Peter, he will give you simple step-by-step instructions on how you can do the exact same thing. He will give you details on designing the prize, setting up the rules, attracting the players, and finding the money. Do you have a business you’d like to start? An invention rolling around in your mind? A big dream that is burning to become reality? Are you tired of working an ordinary job while others are enjoying exponential income growth and enjoying a life of luxury and freedom? Do you long to change the world and do a greater good? Then, my friend... lack of time, money, and know-how no longer need be a barrier for you. With Peter’s new program, you will discover how to make it all happen... no matter what your circumstances are today. Remember Peter’s Law that says, “The day before something is truly a breakthrough, it’s a crazy idea.” So, dream crazy dreams... and let others give you the money and solutions to create a breakthrough! In fact, in Session #4, Peter will show you how to turn your boldest, most ambitious dreams and goals into reality. And, you know, part of that is how to deal with setbacks and failures. Peter is just like the rest of us... he has not won at everything he’s tried. But, he has learned from his mistakes... and he’s courageous enough to share with you some of those lessons. For example, along the way he’s discovered that you need three things to make anything happen. Just three. When you have these things, anything — literally anything — is possible. You, personally, don’t need all three to begin. All you really need are the right people. With the right relationships, the technology and money will appear like magic. Peter will show you the magic of Stone Soup and how to use it in very simple, practical ways. Using this method, Peter was able to get more than a dozen countries around the world to fight for the opportunity to spend $30 million to $40 million to make HIS dreams and goals become a reality. In another situation, Peter used this approach to get $40,000 worth of printing and marketing for free... a vital element to the success of one of his early projects. Would $40,000 help your next big idea move along? Plus, Peter will give you his “Secret Sauce” for coming up with all of his most profitable, history-making ideas. I won’t reveal it here, but let me just say that you can find this at any Barnes and Noble. It’s like the old story of Acres of Diamonds... it’s all around you; you just don’t know what to look for. The world is moving faster and faster. In a real and symbolic way, we are moving from the steam locomotive to the MagLev high-speed electromagnetic train. This kind of change demands constant innovation if you are going to stay relevant, successful, and profitable — regardless of whether you're a company the size of Microsoft, or a local shop. You’ve got to get on the train and stay on, or you’ll be left behind. This might seem like a frightening prospect. And frankly, it is... unless you understand the secrets behind Abundant Innovation. During Session #4, you will discover five different levels of innovation. Peter will give you the secrets behind eliminating fear and other obstacles to innovation. You will also get full details on Peter’s groundbreaking — but very simple — 5x5 Abundant Innovation Plan. Using this 5x5 plan, Peter has been able to generate innovative ideas, products, and solutions for more than 20 years. With this, you’ll have a solid system for staying ahead of the curve to create wealth and make history. Those who make history (even if it is just in their own families and circles of influence) enjoy a life of riches and abundance. What is more, instead of being left behind, they are praised (and well paid) for their leadership, innovation, and contribution to society. This new program by Peter is your rare opportunity to be tutored by the Maker of History Makers. He is giving you his best, most effective secrets to a life of great abundance and influence. Now is the time to get aboard the train and be part of this historic moment in the history of mankind. Now is the time to dream big and turn those dreams into reality. Now is the time to enter into a whole new world of abundance and wealth. Peter will show you how to do it without capital or extreme industry knowledge. You see, today there are about 7 billion people on the planet. Yet, only about 2 billion are connected to the Internet. It is projected that by 2020... just a few short years away... another 3 billion people will come online. These people will become consumers; they will contribute their ideas; they will have a voice. Can you imagine what that will do to our economy, wealth, technology, and societies? The positive impact is incredible. The question is this: What part will you play? Will you sit by as this new chapter in human history is written? Or will you be a bestselling author? Peter is opening the door for you. Order this incredible program now! Please rush me a copy Peter Diamandis’s NEW 6-CD program Get Abundance: Why Your Future Is Brighter Than You Think plus the writable PDF workbook and online assessment today for $79.95, which is 70% OFF the regular program price. Take advantage of this limited-time special discount now. I guarantee that you will discover a whole new world of abundance and riches. If for some reason, you’re not completely satisfied with what you discover inside of Peter’s world of wealth within 30 days, simply return the entire program. No questions asked. Dr. Peter H. Diamandis is an international pioneer in the fields of innovation, incentive competitions, and commercial space. He is the chairman and CEO of the X PRIZE Foundation, best known for its $10 million Ansari X PRIZE for private spaceflight. He is also the co-founder and executive chairman of Singularity University, a graduate-level Silicon Valley institution that studies exponentially growing technologies and their ability to transform industries and solve humanity’s grand challenges. In addition, Peter is co-founder/co-chairman of Planetary Resources, a company designing spacecraft to enable the detection and mining of asteroids for precious materials; the co-founder and vice chairman of Space Adventures, the only company to have brokered the launches of private citizens to the International Space Station; and co-founder and past-CEO of Zero Gravity Corporation, providing weightless parabolic flights. Peter earned an undergraduate degree in Molecular Genetics and a graduate degree in Aerospace Engineering from the Massachusetts Institute of Technology, and received his M.D. from Harvard Medical School. He has won multiple awards, including the first Heinlein Laureate, the 2010 Economist “No Boundaries” Innovator of the Year Award, the 2007 Arthur C. Clarke Award, the 2006 Lindbergh Award, the 2006 Neil Armstrong Award, and first place in the Estes rocket design contest when he was an 8th grader.